Heavenly has made efforts to attract the snowboarding crowd. 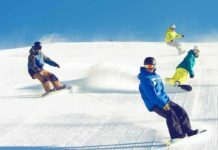 This Lake Tahoe ski resort has terrain parks and groomed runs that help snowboarders enjoy the day. Heavenly Ski Resort is located in the Sierra Nevada mountains of California and Nevada. 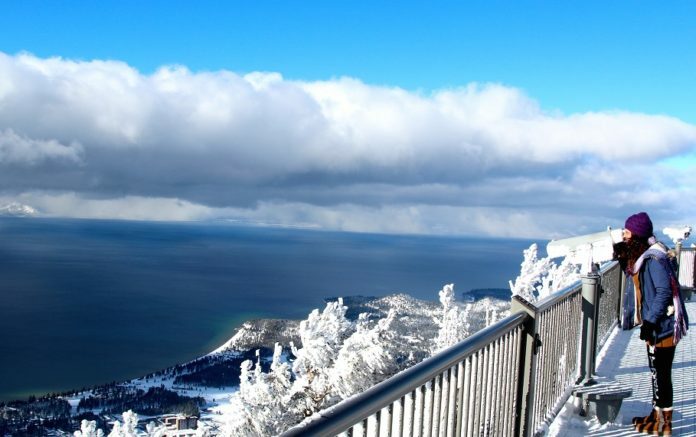 It is the largest of Lake Tahoe’s many ski resorts at over 4,800 acres. 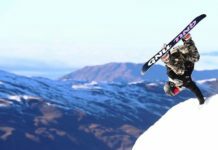 Although Heavenly has historically catered to skiers, the ski resort has made many improvements on the mountain to make it more snowboarder friendly. The easiest Heavenly ski lodge to reach for most visitors is their California lodge. To reach Heavenly’s California lodge, take US-50 to South Lake Tahoe. Turn south on Ski Run Blvd. and follow the signs to Heavenly. Each of Heavenly’s base lodges has a ticket office for buying lift tickets at full price. 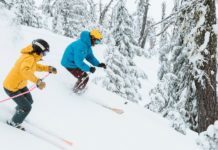 Guests should consider looking for ways to buy discounted lift tickets before arriving in Lake Tahoe. 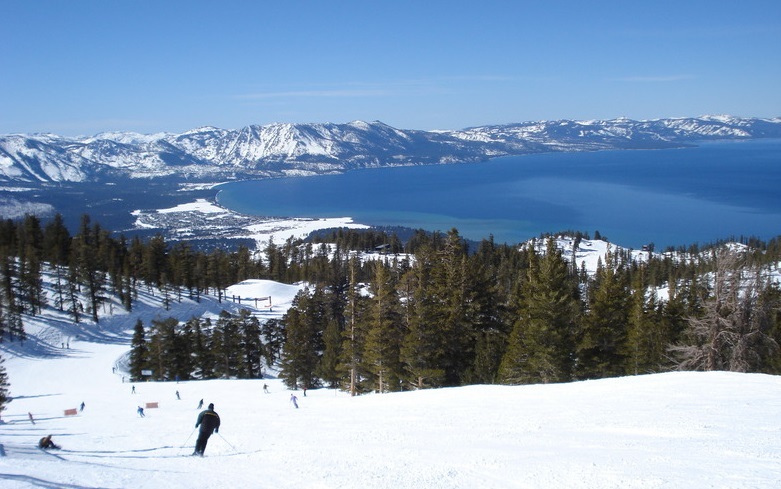 There are three other Heavenly ski lodge including the Gondola entrance which is located near the Lake Tahoe casino hotels such as Harrah’s Lake Tahoe and Harvey’s Lake Tahoe. Those staying at the casinos simply need to walk a few hundred feet west across the California state line to reach the Gondola entrance. The biggest drawback to Heavenly for snowboarders is that some of the trails were designed without snowboarders in mind. A few trails even go uphill, but none of the uphill trails are essential to getting around Heavenly. However, there are traverses that are flat, and some of them are essential to getting around. Two notable flat trails include the trail from the top of Sky Express to Nevada (Skyline Trail) and the trail from Nevada to California (California Trail). 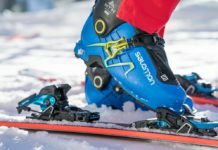 To navigate the flat traverses without running out of momentum, make as small turns as possible and minimize any sideslip during turns. The snowboard should be pointed towards the middle of the trail at all times. If the board is pointing to the side of the trail, it’s likely too much speed will be lost. Remember, snowboarders do not have ski poles to escape the flat sections. All of the exits from chairlifts are graded properly for snowboarders. There are a few that may challenge snowboarders who have a fear of getting off the chairlift. In particular, the ramp from the World Cup lift is a little steep, but still doable for anyone who has no trouble turning with only one foot strapped in. The top of the Gunbarrel Express lift has a long, but mostly straight ramp. 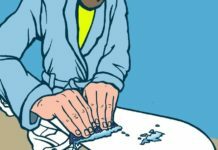 There are a few lifts that fit six people, which may be a nightmare if there are six inexperienced snowboarders trying to get off. In general, experienced snowboarders should not be concerned about getting off of the ski lifts. After getting off the lift, snowboarders can travel on Heavenly’s many groomed trails. It’s possible to spend the entire day cruising on the many miles of groomers available at Heavenly. Orion is a low intermediate trail with fantastic views that’s good for those making the jump to blue runs. Those that want a steep but fast groomed run should try the black diamond Ellie when it’s freshly groomed. There are five terrain parks in Heavenly. 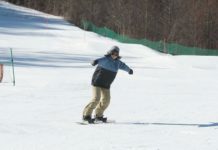 The beginner’s terrain park is located near the top of the Gunbarrel Express lift called Groove. To reach Groove, go down Patsy’s run and take the Groove ski lift. 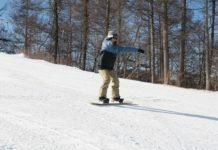 At the top of Groove, ski to the right to reach the entrance of this green level terrain park. The advanced terrain park, called High Roller, is located at the top of the Canyon Express lift, which is located on the California side. The Canyon Express lift is located next to Sky Express chair as well, which can also be taken to reach the terrain park. This is Heavenly’s largest terrain park. Most experienced terrain park users should go here. 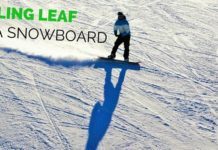 With great groomed runs and terrain parks, Heavenly ski resort has terrain that’s well suited for snowboarders. As long as snowboarders keep their speed up in the flat sections, it should be no problem for them to enjoy the day at Heavenly.